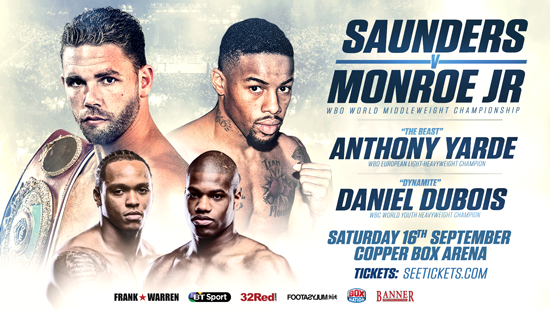 WBO Middleweight World Champion Billy Joe Saunders will make the second defence of his crown against New York’s Willie Monroe Jr on Saturday 16th September at London’s Copper Box Arena, live on BT Sport and BoxNation. Hatfield’s Saunders (24-0, 12 KOs) defeated Irish hero Andy Lee to take the WBO strap in a close and absorbing fight back in December 2015 that saw the undefeated star floor the former Champion twice in the third round and go on to claim a majority decision from the judges. A series of injuries led to a frustrating 2016 for Saunders, but he eventually defended his belt last December against Artur Akavov in Glasgow. Saunders was not at his best, but outpointed the game Russian. He was due to take on Avtandil Khurtsidze before the Georgian’s arrest in June. Monroe Jr (21-2, 6 KOs) has a second chance at winning a World Title after a sixth round stoppage loss against IBF, WBA and WBC Middleweight World Champion Gennady “GGG” Golovkin back in 2015. Since then the 30-year-old has won two decisions over John Thompson and Gabriel Rosado and holds a number five World ranking with the WBO. “Willie is a good fighter and a good boxer,” said Saunders. “This is his big chance and he isn’t coming over here just to make up the numbers. He has been in with some of the best fighters in the World including Golovkin where he came up short. “I am happy for this World Title opportunity,” said Monroe Jr. “I’m always in the gym and I’m ready to go now; I live the life. I can’t wait to show up and show out in London. Saunders is a good fighter and a worthy World Champion but I’m coming for that belt. Saunders’ promoter Frank Warren said: “Bill will have to be at the very top of his game to get the win on September 16th. The winner of this fight will have the missing piece on the Middleweight jigsaw, Canelo and Golovkin both want that WBO belt. Ilford Light-Heavyweight knockout king Anthony Yarde and teenage Heavyweight sensation Daniel Dubois will feature on an action-packed undercard. Yarde picked up the WBO European strap with a first round KO win over Richard Baranyi last time out at the Copper Box Arena while 19 year-old Dubois claimed the WBC World Youth Heavyweight belt in only his fourth contest. Full undercard details will be announced shortly.